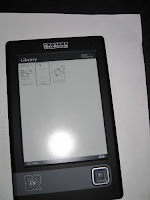 Cube 6-inch eReader based on Windows Mobile 6.5 coming? Cube, a fairly known Chinese manufacturer of media player devices - if you follow the Chinee MID and PMP markets as I do when not blogging here is readying a 6" e-Ink reader based on Windows Mobile 6.5, built in WiFi, a capacitive touchscreen "just like the iPhone" all for 999 Yuan, or about $150. Based on the state of software for Windows Mobile and the traditions of Chinese manufacturers, I wouldn't hold out hope for widespread DRM support on this device. JAVOedge continues their flurry of nook accessory releases, this time with the JAVOedge Black Crock Sleeve Case. Head on over to JAVOedge for more information. Benedict Page, reporting for The Bookseller has news from Penguin CEO John Makinson, calling the eBook the "direct descendent of the 1930's paperback". Back in 1935, Allen Lane founding the publishing company publishing paperbacks. Eventually, hardcover publishers began publishing their own paperbacks, rather than sell the rights to a paperback publishing firm. He mentions that the relatively small cost of producing eBooks is viewed by many authors as a chance to earn higher royalties, but also cites the oft remarked upon "printing is 10% or less of the cost of publishing". Gavin de Becker has signed an exclusive with Amazon, ensuring eBook editions of his books are available only to Kindle users for the next year. I'm not opposed to authors self-publishing, or signing deals with alternative publishers - but I hate to see content withheld to users of non-Kindle readers. The official press release has more information. The Bookeen Cybook 3 gets a workout courtesy of a review by Carly at GearDiary. At $350, it costs almost $100 more than a Kindle or nook, and more than two of the three current Sony Reader's on the market. It would appear to be very thin and lightweight, however she found several flaws including a slower speed than the competition. Worst of all there appears to be no screensaver mode - it's off or on, with a 20-25 second boot time. One thing I appreciate about my eReader is being able to begin reading in about as much time as it takes to remove it from whatever case or sleeve I'm currently playing with. There may be readers boasting over one million books in this country, but North Korea is catching up... well, not really - but they now have about 1,500 translated eBooks available in an obviously censored selection of classics. Publishing Perspectives reports on the Windows-based eReader software that provides access to several notable (but safe) classic books available. In honor of Read an E-Book Week, enter to win a $15 gift card to your choice of either the Sony Reader Store or Amazon.com. nook Available Online & In Store this Week!